All routes lead to Whilton – don’t they? A boat named Pandora was moored nearby last night. Her roof was used for storage: apart from poles, hoses and various plastic containers there was a large rooftop box. The start of a new day travelling on the canals brings the opening of Pandora’s Box to mind: what will the day bring? what might emerge from “the box”? 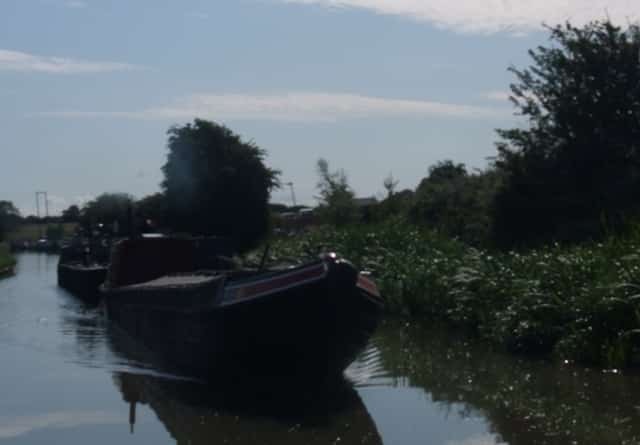 To start with, ticking past us with that beautiful, slow, donk-donk of old engines, came two more old workboats, the first towing a butty loaded with all sorts of old equipment. Then Cleddau set off, skirted the mostly submerged old wooden boat, was greeted by the cockerel from the offside and continued the last mile into Braunston. From the west, Braunston Turn, the junction, is at its picturesque best, the route of the North Oxford Canal going towards Rugby and Coventry under one white railinged Horseley Ironworks bridge while the route down the Grand Union passes below the other. Braunston village lies on a ridge quite high above the bustling world of the canal. How often have we admired the crocketed church spire, (a new word learned last year, which refers to the stone decorative”bumps”). Several times before we have walked up the hill, following the grassy path that leads up to the church. In some circles it is known as “The Cathedral of the Canals”, so major has been its association with canal folk. Inside the church has a cared-for feeling: fairly new woodwork partitioning indicates where a previous vestry has become an office and separate room. The Flower Guild (or equivalent) commands a large amount of space in a back corner; a book display links with the canal’s history but most striking was the beautiful marble font. Brief supply mission over, the crew returned to the canal, where boats of all lengths and vintages were crawling past one another. At one of the boatyards a welder worked away on the roof of a boat. There was a queue for the bottom lock (of six) and then Cleddau‘s progress upwards began. Lock partners this time were going to Whilton, to the vast brokerage there, to swap their boat. 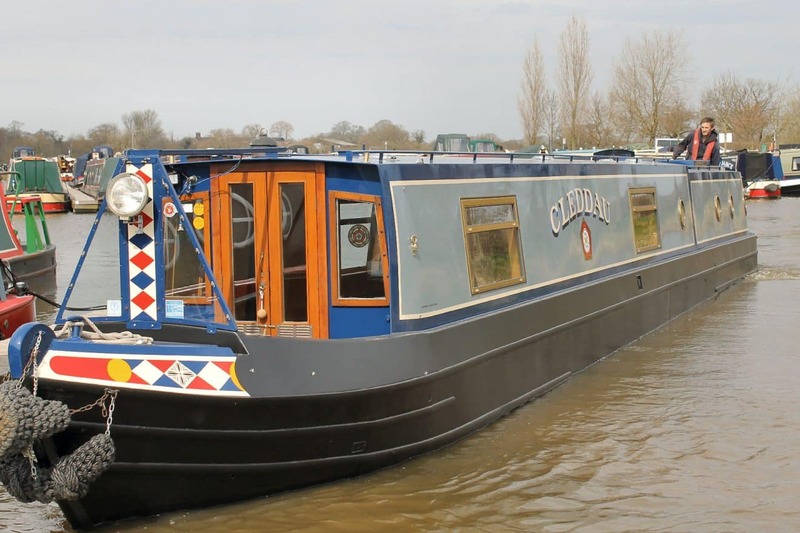 Their current live-aboard craft is about fifty feet long, but they are swapping it for a seventy footer, on account of having seven grandchildren… The boaters ahead aborted after the third lock, rained off, moored up their boats and sought shelter in the pub for lunch. We tougher boaters continued, completed the locks, chugged through the tunnel (2042 yards) and cruised on through the tree-lined cutting towards Norton Junction. What surprise then at the junction to see our travel companions execute a smart left turn. ” We thought you were going to Whilton,” Boatwif shouted. “We are,” replied the skipper. “After a while?” suggested Boatwif. Sheepishly the other skipper confessed, “Oh, we didn’t know, our Nicholson’s Guide Book’s run out, it says go to Book 1!” Some reversing and manoevering occurred! And then we all set about going down the seven locks together. Walkers who have the time, or lock slaves who steal a glance, will see notices explaining how this area has long been recognised as good for transport routes. First were the Romans with Watling Street, known now as the A5, then came the canal, then in the 1800s the railway line, and in the 1960s the M1 motorway. The Cleddau crew in recent times have frequently beaten a path (usually by road) to the door of Whilton Marina, for here resides one Richard, he who promotes and supplies the composting loos. And Radio 4 listeners to PM this very week may have heard him explain the rationale behind the plan to create a new canal arm into Daventry. If lucky, when hurtling up the railway line on a London – Stoke train, a good view over the whole marina can be had. Whilton was reached, ears becoming accustomed slowly to the constant motorway roar, the rushing trains, emergency sirens and even a helicopter. The boat swap folk moored up and the Captain jumped ship for his customary “OK Richard, composting loo still doing well” conversation. Eager for a quieter overnight mooring Cleddau moved on, leaving behind the alternative boaters on whose back deck a guitarist squatted, strumming, past the Free range eggs – from happy hens sign, past the cruel sight of a teddy bear bow fender, past the boat named It’s 5 o’clock –somewhere! Long past 5pm the canal is peaceful now, the light is failing and that squawk from the hedge behind may have been an owl.